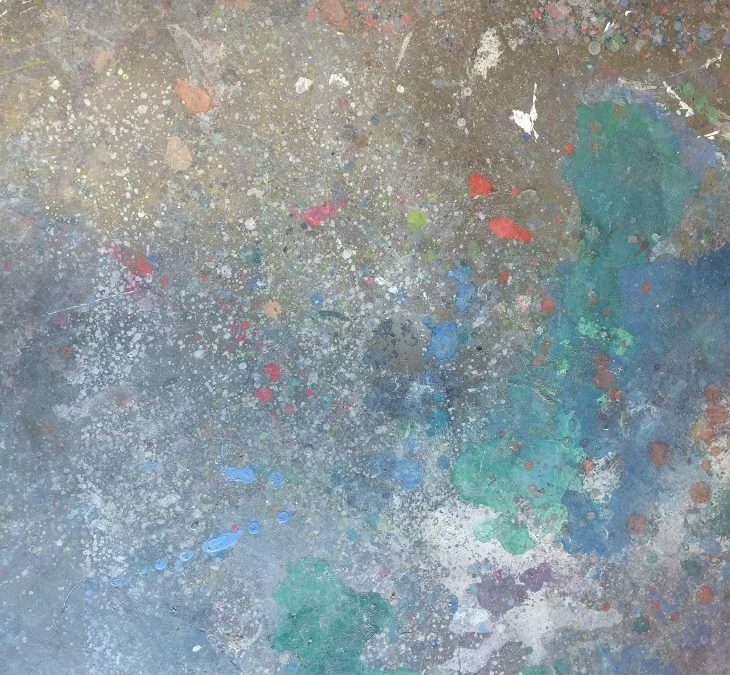 Often, when I have studio visitors, a comment is uttered about my studio floor. It is a concrete floor in my garage; before we bought our home, it was an anemic gray that you’ve seen too many times to recall — punctuated by the occasional crack; aside from that, devoid of feature or interest. After a few years, the cold concrete is delightfully festooned with splatters of every color moving in nearly every direction. It’s chaos under foot. There are energetic splatters and accidental spills (the latter which undoubtedly carried corresponding expletives), rivulets and lazy puddles of every hue and finish. Iridescent green dapples a certain area. Dark hues reminiscent of inky skies are sequestered to another. An outline of a white square consumes a section. My husband, a painter of large, beautiful paintings has lovingly contributed to it. It’s a story line; one of which I am not entirely sure I understand yet. But it would seem that every painting contributes in some lasting way, large or small — to this shifting, changing, evolving larger canvas beneath foot. THAT was a REALLY COOL commentary on your studio floor, Jessica! And, it’s REALLY beautiful! Thanks for sharing! Michael, thank you! I truly appreciate the kind words.